On Friday, September 14, Gallery 5 will host an evening of Indonesian music and dance featuring dancers from the Indonesian embassy accompanied by Richmond’s own Gamelan Raga Kusuma. The performance will include female offering dances and dynamic male mask dancing. The evening begins with concurrent introductory workshops in Balinese dance and gamelan music, from 7 p.m. to 7:45. The workshops will provide an opportunity for Richmonders to try their hand at these traditional Balinese art forms. Workshops are open for community members of all ages, with no previous musical experience required. The concert itself will begin at 8 p.m. and conclude at approximately 9:30. Admission: $15 for combined workshop/concert ($12 student). $10 for concert ($8 student). The Hamner Theater is proud to announce its inaugural tour of local wineries for five weekend performances of Shakespeare’s comedy. Gates open an hour before curtain at each venue; tickets are $10 at the gate (children 10 and under are $5) and are first come, first served, no reservations necessary. Chairs available at Del Fosse, Pollak, Glasshouse or bring your own, bring a blanket and a picnic…bring bug spray! Please DO NOT bring any outside alcoholic beverages! Wine will be available before and during the performance at each winery! Saturday and Sunday, August 18 and 19 at 5pm Sunday’s performance has been rescheduled due to rain to WEDNESDAY, Aug. 22 at 6:30pm – come out for a little mid-week, Midsummer Night’s Dream. Call 361-1999 for reservations or further info. Saturday and Sunday, August 25 and 26 at 7pm TONIGHT’S (SAT., AUG. 25) PERFORMANCE IS ON – whether it is inside the Glasshouse or outside will be decided by 6pm…inside picnic-ing with wine is encouraged! We are fortunate to have the option of playing indoors but feel free to reschedule for an outside date if you prefer. Buy local… local wines and local theater… a winning combination! The Hamner Theater is proud to be a charter member of the Central Virginia Theatre Alliance. Every Sunday Night,C’ville Salsa Club hosts a Salsa night at Club R2in downtown Charlottesville. Everyone is welcome. A free introductory class starts at 8pm, the party begins at 9pm. Everyone is welcome (+21). A free introductory class starts at 9pm.The first two Thursdays of the month will be beginner level classes, the third Thursday will be an intermediate level class, and the fourth Thursday of the month will be an advanced class. The party begins at 10pm. A YOGA AND PILATES STUDIO. Find out where are the best parties in Virginia! The class will meet Tuesdays and Thursdays from 5:00-6:15. This class is not exclusively for dance majors, and is open to all students. As usual,there are a few changes to my schedule this month. New classes will be opening soon, and others are coming to a conclusion. Please take the time to read the articles. If you have any ideas or advice, please do not hesitate to e-mail me. Also, I would like to apologize about my website. It is still under construction. Hopefully it will be up and running soon, but if you need to get information about classes or events, just give me a call or e-mail me. Sorry for the inconvenience. PS: I would appreciate it very much if you could help me advertise my new classes, by simply forwarding this information to your friends. As a performing artist, I collaborate with multiple groups and organizations, therefore I travel a lot and regularly visit multiple cities (DC, Richmond, Charlottesville, Roanoke, etc). However I now consider Harrisonburg as my home base, and for that reason most of my current activities are conducted there. Nonetheless, due to the nature of my job, my schedule tends to fluctuate often, and that is why I like to send out these newsletters to my students, so everyone is aware of my monthly activities. During the month of September, I will be participating in multiple events and dance camps, so my schedule will be more unusual than normal. There are a few changes, so please read the articles about classes. Harrisonburg = Tuesdays – Fridays. Charlottesville = Sundays – Mondays. This series will be offer as part of the Elkton Recreation Dance Fall Program. The classes will meet from 7:30 to 8:30pm at Elkton Recreation Center, on B street at the corner of Ashby Ave. (next door to the Elkton Elementary School). Classes are open to every one!!! Unfortunately, during this fall, I have been compromise to offer multiple workshops outside Harrisonburg VA, and for that reason I will be unable to offer regular classes at the center. However every so often I would be offering an occasional open group class on Fridays at “The Center” (70 N. Mason St., Suite 10, Harrisonburg, VA 22802). Subject: Open Partner Dance Class. These classes will take place at “Alexandra Dance Studio” (above the Box in the Downtown mall). Every Sunday the Charlottesville Salsa Club offers an open salsa party from 9 pm-1 am at R2 on the Downtown Mall. There is an introductory class offered from 8:15-9 pm. I co-teach the classes every other Sunday. If you like to Tango, you should try the Friday night milongas, from 9 till midnight. Held at the Charlottesville Tango Studio, located at the Glass Building (313 Second St, SE, Suite 108Charlottesville VA 22902). This month we will be exploring the world of Bachata. This class will be offer at a beginners level so it is a perfect introduction for new people, and a good reinforcement for dancers with previous experience. This class will focus on Night Club Salsa and its culture. We will cover musicality and footwork.Partners are encouraged but NOT required. This workshop will take place at “TANGUEROS” in Richmond, VA. This is an interactive workshop about Argentine tango and its various artistic interpretations. Students will explore various movements that are sure to help you enhance your repertoire. The class is a beginner/intermediate level based in fundamentals of movement and connections. The second class is Int./Advance and it will based on games and footwork. Classes cost $12 per person at the door. What: An in-depth look on Tango and its possibilities. Cost: $12 per class/person at the door. Blending Blues is a very special workshop about the current interpretation of Blues dance and the various influences gather from other popular contemporary social dances. It is sponsored by The Southwest Virginia Social Dance Society and will be host at the Y Center Stuart Event Room, (1000 North Main St. Blacksburg, VA 24060). This entire workshop is intended to explore the world of Salsa and take it to the next level. This event will be divided into 3 consecutive classes offer in a progressive format (from beginners to advance level). Participants are well come to take the entire series, or select the level that best fits their needs. It is sponsored by VT Salsa Club and will be host at“Old Dominion Ballroom” in Squires Student Center. In an effort to encourage black audiences to attend theatrical performances and be involved in larger theater community, Leslie M. Baskfield and company decided to create a theatre company. Thus Melanin was born two years ago in collaboration with Live Arts in Charlottesville. As part of their mission to offer diversity in content, this weekend they are performing Between Barack and a Hard Place with two shows nightly. The show’s format is a free style rap debate in between comedic performances. “We thought it would be really a cool thing to explore the different ways the black community thinks about Barack,” says Baskfield. Meditation took the place of asana practice this morning as it was raining and their really wasn’t an alternative yoga location in the house with out moving major furniture or being in the way of Marilyn and Gregory setting up breakfast in the dining room. Again, the Hawthorne Inn breakfast delighted. This morning we were served Gregory’s recipe for poached pears in ginger a lemon, walnut sauce topped with blueberries and creme fresh. YUM! Then more of Marilyn’s mouthwatering secret recipe granola with yogurt followed by a cheese and veggie omlet with smoked salmon. A hearty meal to prepare us for the fairly short drive to Hyannis. I was worried about possible traffic as it is race week on Nantucket so we left early. My navigator having been dismayed by getting lost several times on the journey from Greenwich to Concord, was more diligent with her focus. We arrived in Hyannis without incident two hours before our ferry departure which would have been fine except for the chilly rain. Having nowhere to go, we flipped up the tailgate and ate the remainder of our goat gouda from our picnic the previous night, some crackers, the marzipan (which we failed to consume the night prior) and a blood orange Pellagrino soda. We walk in the rain over to the pier for the slow ferry to Nantucket. There are two ferry speeds; the slow ferry which takes two hours and the fast one which travels the distance between the mainland and Nantucket Island in half that time. 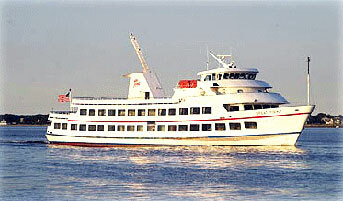 The slow ferry is much cheaper and thanks to a special summer promotion, kids 12 and under ride free. It was a no brainer choice for a struggling freelance writer. Onc boarded, Sam I and spent one hour entertaining ourselves with various technology then agreed to play a few games of Uno. The time passed relatively quickly and Candace was at the ready with her boyfriend’s SUV to pick us up and drive us the short distance to her parent’s charming, vacation home. Post cocktails dockside at the Nantucket Yacht Club in the Panerai Promotional Tent, Candace, her beau and I drove over to the west side of the island and watched the sunset- a red-orange ball glowing like an ember in the bottom of a grey clouded sky spewing hot pink and red light in a vivid line along he horizon. It was stunning. Following a home- made lasagna for dinner we went to bed early and slept comfortably with window opened to the cool night air. It is race week in Nantucket and we are going out on a motor boat in the morning to see the Rainbow Fleet Parade of small sailboats that usher the racing boats out to the start of the Opera House Cup course. This Weekend, An Evening of Love Songs ! And Have You Secured Your Tickets for RTP’s 20th Anniversary Gala ? Use our convenientonline ticketing serviceto pick and print your tickets! Call our Ticket Hotline at 346-8113 or e-mail us atresv@rtriangle.org if you have any questions! Richmond Triangle Players, Inc. is a 501(c)3 non-profit corporation. We accept tax deductible contributions as allowed by law. Help support our Annual Fund or Next Stage Campaign by making a contribution today! Our theater is located just two blocks northwest of the intersection of Boulevard and Broad, on the corner of Altamont and Marshall Streets, in historic Scott’s Addition. Nearby restaurants include: Lunch, Bill’s Barbecue, Kitchen 64, and Nations, among others. Do you enjoy meeting new people and trying new things? Do you enjoy giving back to the community? Then Richmond Triangle Players is the place for you! If you have a few hours or many, occasional time or regular, particular skills or desire to learn something new – contact us. We’ll match your interests with our needs. Love, Me: A Musical Theater Cabaret explores the three journeys of finding love, being in love, and the end of love. It is the moments of rapture that allow us to believe in the goodness of the world and the falling out of love that is our bitter reminder that life is hard. Through these songs we tell three stories which are a reflection of the one story everyone wants to have — a story about love. Pigs Will Be Flown Tonight! Robyn O’Neill, Robert Throckmorton, and the original casts of When Pigs Flyand The Stops ! Plus, our headliner, Renowned Broadway Chanteuse, Actress and Dancer Terri White ! Terri stops the show in Sondheim’s Follies! and in her own cabaret ! Tickets: $100 per person; $250 for VIP seating and a special reception! Get more information, or buy a ticket now! The four poster bed in the Concord Room at the Hawthorne Inn yielded a lovely sleep. I awoke to the sounds of birds chirping and a gentle breeze wafting through the open windows. Sam slept on as I dressed and sauntered out to the garden, a beach towel and mat in hand, for my morning puja and hour long yoga practice before breakfast. The garden is big and filled with a variety of flowers, trees and shrubs attracting birds of all types. A charming little hummingbird sips from some sort of trumpet- like flower while I move through my asana practice. A highlight of staying at The Hawthorne is the breakfast. The first course is a medley of fresh fruit including watermelon, cantaloupe, Mandarin oranges, and grapes served with your choice of fresh squeezed orang, grapefruit or an orange/grape juice combo. The next course is a delectable house-made granola, a recipe that Marilyn has created herself and sadly for me, refuses to share but I can tell there is maple syrup in it. The granola comes with your choice of plain or strawberry yogurt or milk. I had to stop there but all the other guests were served eggs with tomatoes, green peppers and cheese served with toast (in Sam’s case, gluten free toast). One of the fun things about staying in a B&B is conversing with the other guests. We met a couple who have relatives in my home town and indeed had a niece or something who had attended Montessori school with Sam. The other couple at the table had an adorable four month old baby they let me hold while they consumed the egg course of their breakfast. Marilyn helped us create the day’s itinerary according to the weather forecast and off we went back towards the city, our first destination being Writer’s Ridge at Sleepy Hollow Cemetery. We decided to walk against Marilyn’s advice and later regretted eating up the time but we did get to see the architecture and gardens up close along the way. Sleep Hollow is a fairly big cemetery and Writer’s Ridge is a good distance if on foot. We saw the graves of Samuel French, Louisa May Alcott and her parents and sisters, Emerson, Hawthorne and Thoreau’s. We took photos of gravestones for Sam’s Grandmother who is enamored of cemeteries and collects images of famous people’s death markers. Next stop and pleasant walk to North Bridge, the sight of the first battle of the Revolutionary War. There is an excellent tour one can access by phone describing and explaining the importance of various points of interest. Canoes can be rented and paddled up or down the creek that flows under the bridge. We were getting hot and hungry at this juncture so we walked back into town and stopped at the Colonial Inn. Although the food is reported to be inconsistent at the Colonial Inn, my friend Janis Jaquith implored me to eat there as she spent a night there on her honeymoon trip and loves a good ghost story. Yep, it is supposedly haunted and there are actually printed handouts describing some of the incidents on hand in the gift shop. Sam was fascinated by this aspect of the place, making our lunch even more of a thrill for her. I am happy to report that the only thing scary about our meal was the waiter who was a bit too deadpan for my taste but the food was great. Sam’s BLT salad was a flavorful plate of romaine lettuce with maple bacon chunks, cherry tomatoes and a creamy ranch dressing. Her side order of sweet fries were crispy yet light and airy- truly unique and delicious. I thoroughly enjoyed a bowl of steamed mussels simmered in a coconut curry broth with strands of onion. A slice of moist, flowerless chocolate cake complemented the flavors of our “entrees”. Energy restored, we ventured over to the Concord Museum where it was free family fun Friday (lucky for us!) On Fridays during the summer there is free admission, making me grateful that we waited until Friday to come. There are exhibits of clocks, period rooms, Thoreau’s cabin furniture, Emerson’s study, costumed re-enactors and on the top floor a series of photographs by Annie Leibowitz, many of which have ties to Concord. I enjoyed thinking of connections I had to each subject of the photos and sharing them to Ad nauseam with Sam. We walked back to the Inn around 4:00pm for a siesta in the heat of the day before going by car back into town to the Cheese shop to buy items for a picnic on the “beach” at Waldon Pond. The Cheese Shop has take-out food and a vast selection of gourmet cheeses and fresh bread to go with them. They carry one or two kinds of gluten free crackers for those of us who care about that sort of thing. We had a tarragon chicken salad, greek salad of peppers, cucumber, grape tomatoes and feta, a half dozen dolmas, some super expensive yet wonderful goat gouda, rice crackers and some dark chocolate covered marzipan for our pond-side meal. Walden Pond is big and a popular destination on warm summer evenings. On the way to the pond from the pay-to-park parking lot is a replica of Thoreau’s Cabin which fascinates by its small size and sturdiness. At the pond itself, there are a couple of little stretches of sand, a roped off children’s swim area, a bath house that was oddly closed at the height of the season and a place to rent canoes and kayaks. The water is clear and the pond bottom is solid and silt free. Sam met some other girls and enjoyed playing in the pond while I, who forgot my iPhone at the Inn during this outing, simply relaxed on the beach observing people and cloud formations floating across the sky. The park closes at 8:00pm so we stayed as late as we could before heading back to the Hawthorne Inn to relax and prepare for the drive to Hyannis in the morning. Sam and I drove to Greenwich, CT after a lovely visit with Gene in SoHo and made it, thanks to Sam’s excellent navigation skills, to Greenwich, Ct in 45 minutes from the Lower West Side- pretty impressive considering it was raining, dark and there was traffic at the George Washington Bridge. I was truly grateful to have Sam helping by carefully reporting directions listed on my iPhone’s navigation system because getting in the correct lanes before going over the bridge is critical. The LAST thing you EVER want to do is get in the lane that takes you into the Bronx particularly at night with out of state plates (especially in a beacon of suburbia like my 2005 Blue Ford Escape Hybrid). It is like entering a maze in HELL where you will not get out for hours if ever. But we avoided the worst case scenario and made it neatly to Greenwich in record time. I am so proud. We stayed with my dear long-time friend Candace Lau Hansen who I refer to, in typical Southern fashion, by her nick and maiden names, Candy Ruddy- and she is kind enough to indulge me. Candace has a cute two bedroom apartment in the heart of Greenwich near the Whole Foods (how utterly convenient!). We had a nice catch-up chat and went to bed early because we are middle-aged and she has to go into the city to work at her high-powered job. The next morning Sam slept in a little- she is growing after all- and we packed up and headed out around 10:00am and proceeded to get lost three times on the way to Concord. 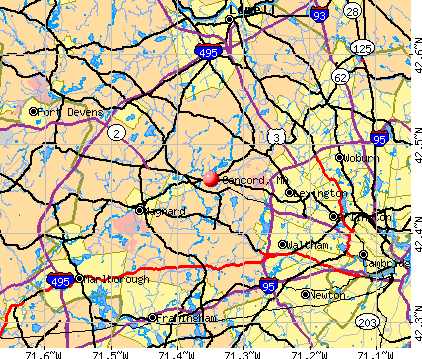 We did however, by suggestion of another friend who used to live in Boston, make part of the way up the Merrit Parkway. It is a gorgeous drive and I highly recommend it. We also stopped near Stamford to shop for lunch items at a grocery store and find a spot along a local road for a leisurely tailgate picnic lunch. We arrived in Concord around 4:00pm and immediately went to check in at the Hawthorne Inn, our home away from home for the next two days. The Hawthorne Inn is located on rt 2 directly across from Wayside, one of the historic homes of Concord lived in by Emerson, the Alcotts and probably Thoreau (they all seem to live in the same houses around here). The land on which the large Victorian B&B stands was owned by the Alcotts and apparently they gardened here. “There is mint growing in the garden that was probably planted by the Alcotts,” joked Gregory Burch co-owner and operator of the Inn. The other owner is his lovely bride, Marilyn Mudry who is a charming and vivacious hostess. The Hawthorne is a wonderful place, romantic and eclectic with its Victorian furnishings accented with all types of art from Burch’s original carvings to Japanese ukiyo-e prints, Haitian Voodoo masks, acrylics from a local artist and an impressive collection of salt and pepper shakers. 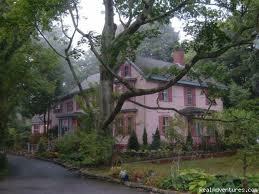 In typical New England style the place is huge and rambling with a large back yard which is open for guests to enjoy. I saw a hummingbird sip nectar from a flower this morning as I practiced yoga on the back lawn – quite magical. My favorite room is the parlor done up in green Victorian furniture. I had tea there last night and enjoyed a glass of red wine there this evening as I attempted to read WALDEN; OR, LIFE IN THE WOODS by Henry David Thoreau. Marilyn met us yesterday afternoon when we arrived and instantly prepared tea and snacks for us. We are staying in the very cool Concord Room at the back of the Inn, apparently situated above the kitchen but quiet. 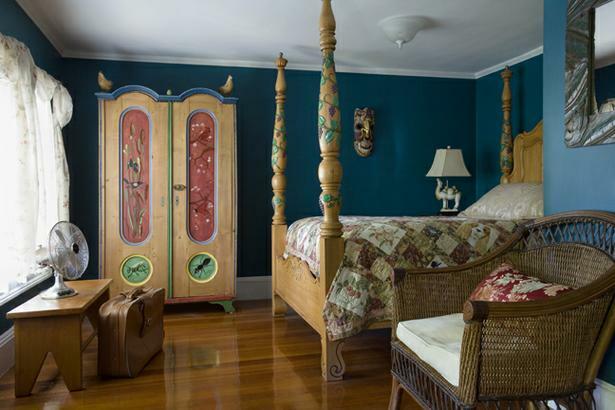 I adore the four poster bed carved with grape vines and the cabinet painted with birds and bugs. Since our reason for coming to Concord was to see Orchard House, the one time home of Louisa May Alcott where she wrote LITTLE WOMEN, we stopped there first. They are open until 8:00pm on Thursdays so that worked out perfectly. Orchard House is a short walk from the Inn, maybe half a block at most so it is very convenient. We took the standard tour ably guided by Lily and kicked off with a 15 minute informational video. Lily was quite knowledgable and determined to give all the gifted Alcotts their due. I felt a tingling sensation throughout my body as I stood before LMA’s writing desk – hopefully a sign that she is sharing her stardust or at least recognizes me as a fellow writer. 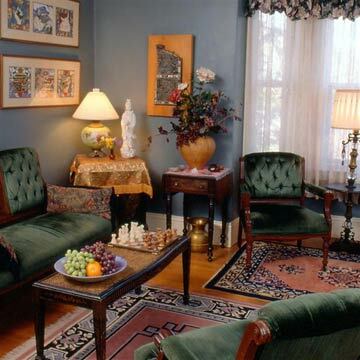 But my favorite room in the house was May Alcott’s. She was a fairly accomplished fine artist and she had been allowed to draw all over her room leaving beautiful sketches of mythical gods and goddesses, fairies and such all over the window and door frames. She was also Lincoln Memorial sculptor, Samuel French’s first art teacher. The Alcotts were people very much interested in education, art, social reform and nature which are common interests. I would have greatly enjoyed putting on theatricals in their parlor and chatting it up with their good friends Emerson and Thoreau. The tour gives a broad view of their lives and accomplishments. After our tour we strolled a short distance (maybe a quarter mile) into “town” and enjoyed a good dinner at The Main Street Cafe. I ordered a seared tuna with seaweed salad appetizer and a melon salad with feta, olives, mint and red onion. Sam got salad Caprese with basil pesto. All dishes were well-prepared and delicious. There is often live music in the evenings and we were pretty much tortured with the song stylings of some local group but it was still fun. A dark walk back to the Hawthorne was followed by a relaxing cup of tea in the parlor. A great way to begin our visit to Concord. Nine separate stories of togetherness and everything that makes us human. Consider this a friendly reminder. Nine new short plays from local playwrights, served up with love. All tickets are $10. Tickets may be purchased online at www.livearts.org or by calling the Live Arts Box Office at 434-977-4177 x 108. Live Arts, located at 123 East Water Street in Downtown Charlottesville, has been forging theater and community for over 20 years. For more information, please contact Jigsaw Jones at (434) 977-4177 x103, or email jigsaw@livearts.org. Europeans have a much healthier attitude about vacation time than we do Stateside- they actually take them AND for much more reasonable amounts of time. In Germany, the average person starts out with six weeks of vacation rather than a skimpy two weeks or none in some cases in America. All over Europe it is common to take the entire month of August off and just go somewhere else. (This summer migration often happens amongst the rich and upper middle classes in Manhattan as well. Woody Allen comments about this in one of his older films, maybe ANNIE HALL, about how his therapist disappears in August every year or something.) Eur0peans understand the restorative value of spending time away from normal routines and getting to know your family via a holiday and in fact until the slump in our economy forced more productivity out of less people working causing our productivity rates to rise in the US, Europe had a much higher productivity rate partly due to the vacation taking culture. 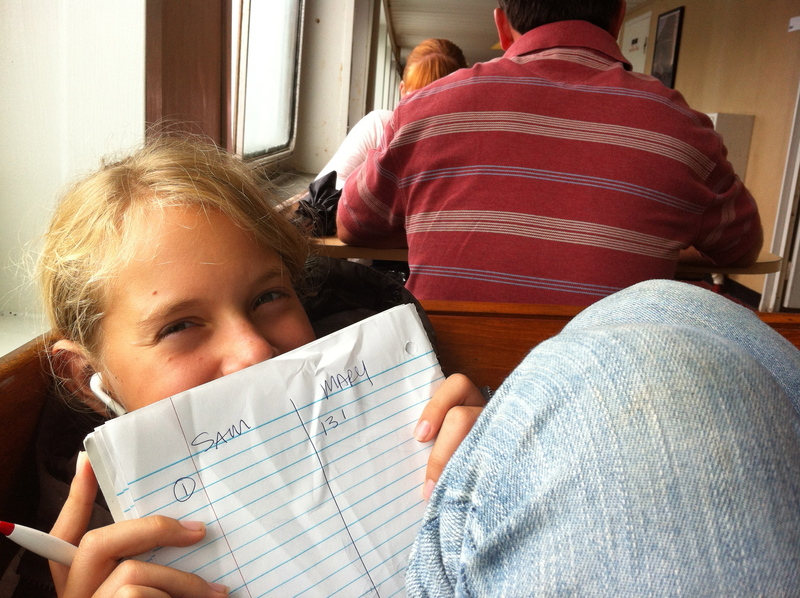 So I have decided to take a vacation with my daughter, Sam. We are going on a classic road trip, staying mostly with friends or family and driving from our gorgeous home in Central Virginia to Massachusetts. 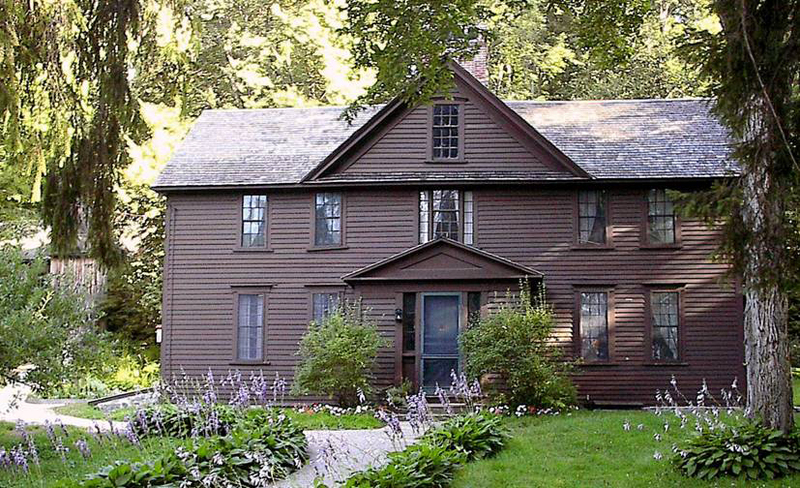 We are going on a quest to Concord to visit the homes of famous writers like Alcott, Emerson and Thoreau- a trip inspired by our reading aloud of LITTLE WOMEN at bedtimes for a year or so. While we are up there we will shoot over to Nantucket for a couple of days to visit my dear friends, The Ruddy’s whose daughter I have know since the sixth grade (a long time at this juncture in life). Our first stop headed north was Olde Towne Alexandria in Virginia. We took the stunningly beautiful drive up Rt 22 from Charlottesville through Gordonsville and Orange to Rt 3 then over to I-95 North to Alexandria. The stretch of 22 features rolling green hills dotted with forests but mostly picturesque horse farms featuring large manor houses and the occasional thoroughbred. Keswick Vineyards is along the way about half-way between the Pantops area of Charlottesville and Gordonsville and makes a nice stopping point for a quick tasting and/or a picnic. They offer a chocolate dessert wine that is a local favorite. Barboursville Winery is not far off the trail near Gordonsville and offers some of the very best in Virginia wines if you are so inclined. 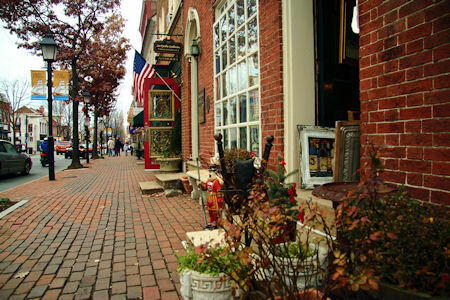 Orange is a charming little southern town and boasts Montpiller, the nearby home of James Madison. There are also battle grounds from both the Revolutionary and Civil Wars for history buffs. We stopped in Olde Towne so that Sam could have a special dinner with her Grandmother and Grandfriend (Grandma’s live in partner for ten years). 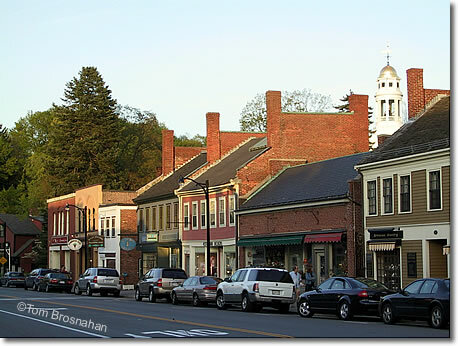 We are former Olde Towne residents so it fails to hold the charm for us that it might for other visitors but it is a wonderful place full of cute shops, restaurants, art galleries and a lovely waterfront set up for walks and other leisure activities including sailing and motor boating. There is a great bike trail that goes through Olde Towne, that begins west of Memorial Bridge in Arlington and goes all the way to Mt. Vernon, the home of George Washington. On Saturday mornings there is a great Farmer’s Market in the Town Square. Dog lovers will find water dishes and dog treats available at many local shops and a few restaurants offer special “yappy” hours where patrons may bring their four legged friends. We parked ourselves at the Lorien, which is my favorite hotel in the area. It is located on King Street, close to the Metro but not so much in the mayhem. It is also only a few blocks from my former mother-in-law’s home, making it convenient to rendezvous for a visit with my dog (who now lives in Olde Towne with my ex-husband) and to connect Sam with her Grandmother. But I would stay at the Lorien even if it wasn’t geographically desirable to the “relatives” because it is so chic, the restaurant Brabo is so good and the bedding is so luscious. They also have a fantastic spa which I wrote about in an article for VIRGINIA LIVING (Click here for article). After delivering my daughter to her Grandmother and walking my darling dog, I ventured out to run a shopping errand and have dinner with my ex (we are on friendly terms and since neither of us was invited to dine with our daughter and co. we thought it would be a sort of tongue in cheek sour grapes rebellion. We buzzed north on Rt 1 in his yellow Saab convertible to Pentagon City Mall in Chrystal City where I popped in to Nordstrom to pick up some Kiehl’s products (ahh the convenience of the city) then headed back into Olde Towne for dinner at La Tasca, a tapas restaurant located on King Street near Washington St across from Antrhropology. 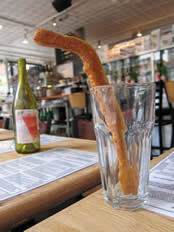 La Tosca is part of a local chain of five restaurants but feels like a bigger chain. I never would have chosen it as I prefer unique local spots with stellar food but my ex was buying and this is where he wanted to go plus I adore tapas. The first thing I do when at a Spanish restaurant is ask to taste the Sangria. The way they handle this traditional Spanish drink usually indicates how much they will care to make the rest of the meal authentic and delicious. The traditional offering tasted musty and was frankly undrinkable. So we chose a Rioja to drink instead and it was OK but not fabulous. Then we began to order tapas. The best two were an eggplant stuffed with sundried tomatoes, goat cheese and pine nuts and a roasted brussels sprouts with caramelized onions, almond slivers and “Manchego”. All the meats were over cooked, the chiorizo’s were small and red and weird and just nothing to write home about. But the kicker for me was the un-announced replacement of the Manchego with Blue Cheese. The perfectly cooked brussels sprouts were flavorful and I scarfed about half of them down before detecting a flavor I felt should not be present in a dish made with Manchego. Then my stomach told me the truth. You see, I have a gastro- intestinal issue that prevents me from digesting blue cheese so I avoid it at all costs because when I do eat it I am in bloated stomach cramp misery until I suffer through a three day liquid diet purge. I NEVER would order something that contained blue cheese and by failing to disclose the substitution this restaurant endangered my health and caused me great discomfort. The waitress was very polite and checked with the kitchen staff to confirm my suspicion and the manager kindly comped our dinner (much to the glee of my ex) but I would never go back to La Tosca for any reason and they should consider themselves lucky that I am too lazy to sue them. The Lorien, however was lovely as usual and if I had to suffer stomach cramps all night long at least I did so in a comfortable space. Tossing and turning in high count all cotton sheets enveloped in feather pillows in a sweet smelling room is much better than being in a scratchy sheet, smelly, noisy room elsewhere. The staff is so Zen and professional too and the mint tea offered in the sitting room in the morning certainly helped me to feel better and more refreshed. I would stay there any time and recommend it highly to anyone. On Wed morning we headed north to NYC for a pit stop before landing at my friend’s in Greenwich for the night. We drove into town through the Holland Tunnel and headed north east to my old neighborhood near Gramercy park. We parked the car next to the park and I showed my daughter the lobby of 254 Park Ave South, the building I lived in back in the late 1980’s. 254 has gone co-op now and it all re-done in a chic European decor- very different from when I lived there. Then we walked in the rain west one block to 5th Ave and up to 49th to the American Girl Store, three floors of girl and doll bliss. 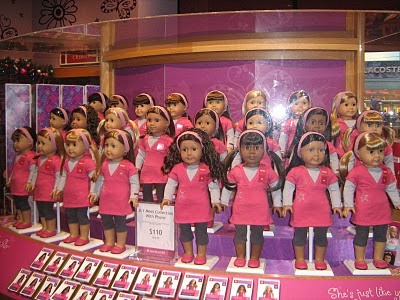 Sam is 12 and I have been telling her for 6 years that one day we would go to the American Girl store in New York. This was our last chance as I am betting in a few months she will loose all interest in dolls and not want to go many places like that. She really enjoyed it though the only purchase we made was a book about how to handle boys- a growing concern for this rising 7th grader. After checking that off the bucket list, we walked over to Lexington and took the 6 train back down to Gramercy. Rain in the summer in Manhattan is a blessing because otherwise the humidity and stench is unbearable. The rain cleans the air and the streets and gives the city a temporary reprieve from the summer stink that urges anyone sane who can afford it to vacate until September. We chose Rissoteria for dinner as it is noted as one of the best gluten free restaurants in New York. We drove to SoHo and found a sweet parking spot a block away. Rissoteria is small but really good. Sam had a panini with ham, sundried tomatoes, arugula and pesto with mozzarella cheese. I ordered a thin crust pizza with sausage. Both were fabulous and we relished eating bread in a restaurant. Then we met my actor friend, Gene for some gelato a few blocks away. A sweet way to end the second day of our road trip.